I have fond memories of a stew frequently made by my mom growing up. We always referred to it as her “brown stew”. 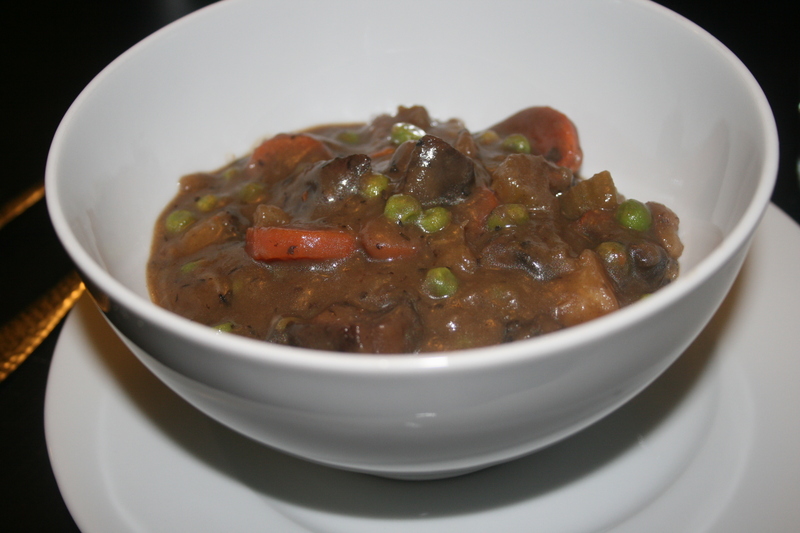 It was a thick and hearty beef stew, filled with carrots, potatoes, peas and celery; and it was always a winter favorite. Paired with a crusty slice of Italian bread smeared with a pat of butter, it was stick to your bones comfort in a bowl. 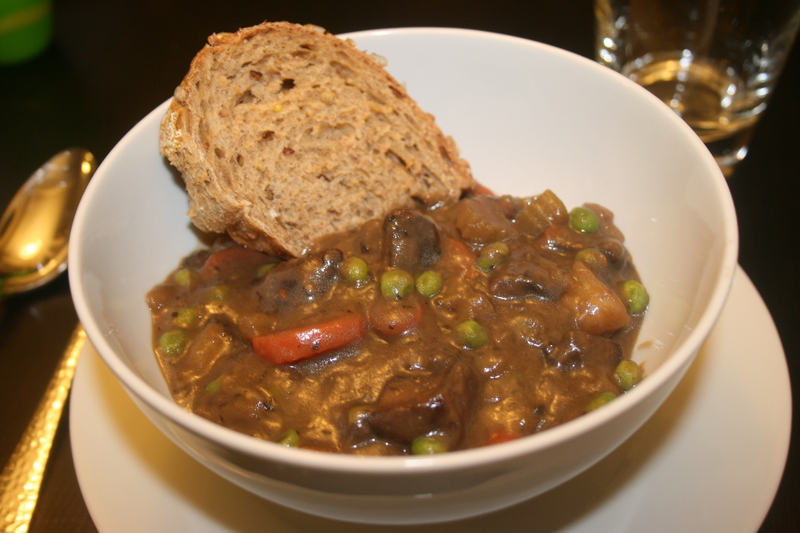 I was reminded of this wonderful stew recently while talking to my sister-in-law. She mentioned in passing that she was making mom’s “brown stew” for dinner. Just her mention of that old favorite got the wheels turning in my head. Could I make a stew that would replicate (or gasp!, maybe even improve upon) mom’s flavors without relying on meat? I immediately knew that Portobello mushrooms would need to be a part of my plan of attack. Their meaty flavor and texture would be a good replacement for the round steak called for in my mom’s recipe; but I also knew it wasn’t going to be as simple as just putting mushrooms in mom’s recipe instead of beef. My mom’s stew derived a lot of its flavor from the slow cooking of the meat itself and the rendering of its fat and juices into the liquid and vegetables. Her stew called for very little in the way of spices or seasoning, other than some red wine and worcestershire sauce. Although the transformation would likely be a bit of a challenge, I felt ready to take it on. The more time I have spent in the kitchen trying new recipes, and exploring cuisines and ingredients outside my comfort zone, the more comfortable I have becoming with developing flavors in more classic dishes. So, a couple of days ago, when faced with one of the few dreary, rain-soaked days we have had to endure in this otherwise glorious NYC winter, I knew it was the perfect day to give the recipe for my version of “brown stew” that had been percolating in my mind a shot. A Quick Note on the Worcestershire sauce: After I dumped the Worcestershire sauce into the pan I checked the label and realized it contains anchovy paste of one of its ingredients. Ugh. This is why not making assumptions and reading labels is important. I should know better by now! In any event, this is not a vegan recipe as written; however, I think it still qualifies as plant-based. To make this a truly vegan recipe, you could try replacing the Worcestershire with soy sauce, tamari, or Bragg’s liquid aminos. The flavor profiles are not exactly true to Worcestershire, but I think they are close enough to give you the same effect. You can also find vegan Worcestershire sauce in some stores, including Whole Foods. Directions: Sprinkle the bottom of a large sauce pan with the coarse sea salt and allow heating for 1-2 minutes over medium heat. Add the extra virgin olive oil and allow to heat for another minute or two. When oil is heated, add the onions, carrots, celery, and bay leaves and sauté for 7-10 minutes until onions are translucent and veggies start to soften. Meanwhile, prepare a dredge mix for the mushrooms by combining the flour, fresh ground black pepper, and dried thyme. Toss the cubed mushrooms in the dredge mixture until completely coated. Prepare a large skillet over medium heat and coat the bottom with olive oil. Add the coated mushrooms and cook until they are browned on all sides. Back in the saucepan, when veggies are ready, add the mushroom broth, red wine, Worcestershire sauce and potatoes. Bring to a boil over medium/high heat for approximately 10-15 minutes. Add the browned mushrooms to the pan and continue to cook the mixture for another 20 minutes, stirring frequently. Lower heat; add peas and simmer until ready to serve, stirring occasionally. Thanks! I love peas too 🙂 My husband, on the other hand, is a different story. But I told him if I make stew, he has to suffer through the peas. 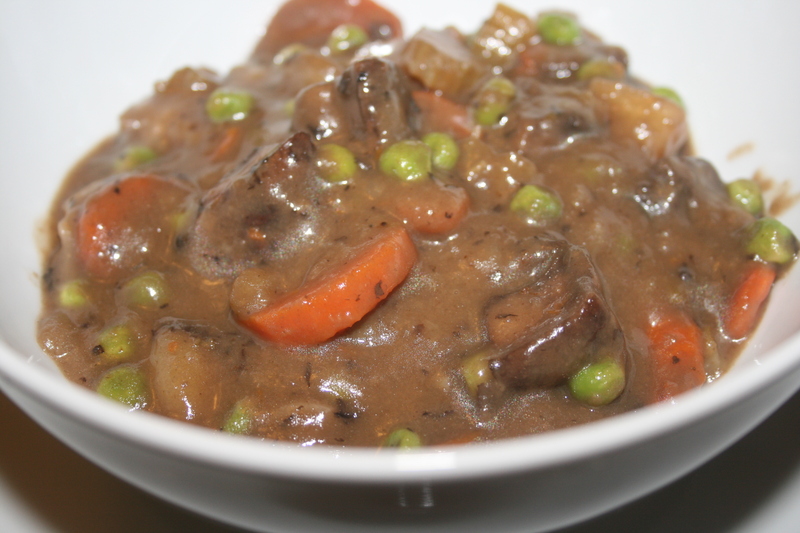 You can’t have stew without peas!! !